The Muleshoe National Wildlife Refuge was the first National Wildlife Refuge established in Texas in 1935. The refuge lands are some of the only remaining native short grass prairie that has never been broken by a plow. The refuge resembles what the region would have looked like 200 plus years ago when Native American tribes and bison roamed the Llano Estacado. Muleshoe was established as a wintering area for migrating waterfowl and sandhill cranes. The refuge hosts on average 80,000 to 100,000 sandhill cranes annually. It is managed for the benefit of wildlife and is open to the public for wildlife watching. From Muleshoe, Texas: Take Highway 214 south 20 miles. Drive west on County Road 1248 and go approximately 2.25 miles to Headquarters. From Morton, Texas: Take Highway 214 north 18 miles. Drive west on County Road 1248 and go approximately 2.25 miles to Headquarters. Grulla National Wildlife Refuge has 3,236-acres and was officially established as a National Wildlife Refuge when its lands were transferred from the Bureau of Land Management in 1969. The refuge is a protected roost site for sandhill cranes and provides winter habitat for migratory waterfowl. It is managed for the benefit of wildlife and is open to the public for wildlife watching. From Muleshoe, Texas: Go south six miles on Highway 214, then follow FM 746 west approximately 22 miles to the New Mexico state line. Turn left onto the 1/2 mile long entrance road, which ends at a small parking area. From Portales, New Mexico: Go approximately 25 miles southeast on Highway 88 to the Texas state line, then turn right onto the Refuge entrance road. This refuge was established in 1959 and encompasses 7,667 acres that includes a variety of habitats important to many species of wildlife, including short grass prairie, riparian, marsh, and woodland habitats. Visitors can enjoy wildlife-dependent recreation, including wildlife watching and photography and environmental education programs and special events. The primary focus of management activities is on migratory bird conservation. More than 300 species of migratory birds have been recorded on the refuge, including warblers, flycatchers, tanagers, orioles, sparrows, and many others. It is managed for the benefit of wildlife and is open to the public for wildlife watching. 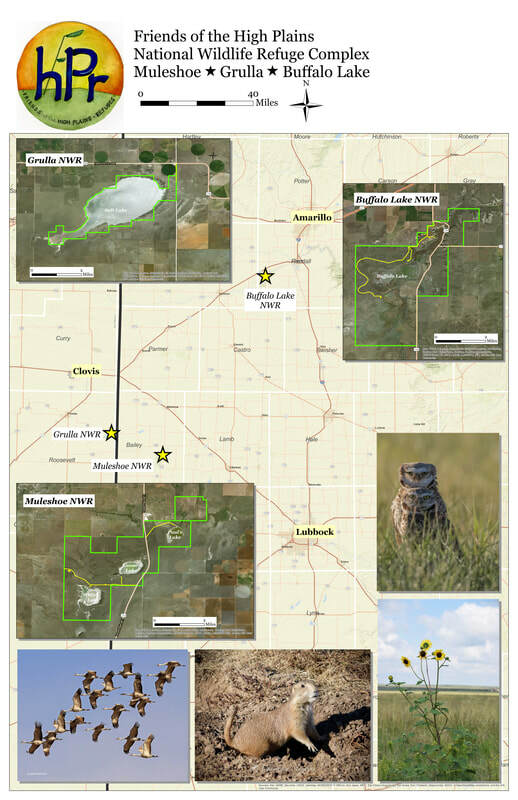 The Refuge is located 1.5 miles south of Umbarger, which 10 miles west of Canyon, 15 miles east of Hereford, and 30 miles southwest of Amarillo.